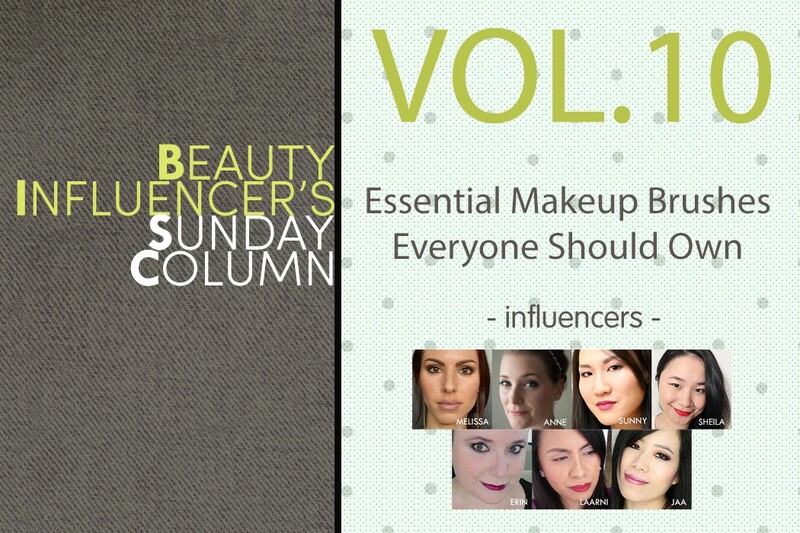 Beauty Influencer’s Sunday Column Vol.10: ​What are essential makeup brushes everyone should own? Last year I put a little overview of my favorite make-up brushes for the eyes and face on the blog and now more than a year later I still stand by my choices. MAC and Sigma are my two favorite brands for eye make-up brushes. And one of my all-time favorite face brushes is the (crazy cheap) e.l.f. Stipple Brush and – of course – my trusted Beauty Blender. For a detailed review on all of my favorite brushes you can click here and here! 1) MAC 217/Hakuhodo J5523. It’s great for applying a wash of color, blending eyeshadows out, and even buffing undereye concealer into the skin. Basically, you will have a hard time finding anything 217 cannot do! 2) MAC 219: I use it to highlight the inner corners, smudging eyeshadow over the gel liner on my lower lash line, and sometimes laying a darker eyeshadow in my outer v. If you want to do any detailed work to make your eye look more polished/finished, you need 219. 3) Let me cheat by adding Dior Backstage Blender to the list! Wayne Goss 02 – a good quality yet relatively inexpensive substitute for the Suqqu cheek brush. It’s SO soft and the size is perfect to use as a blush, bronzer, contour, or small powder brush. Super versatile. I personally love a lot of different brands, but you can’t beat Real Techniques or Sonia Kashuk for beginners and experts alike. 5. Sonia Kashuk Flat Top Brush. Some of my high-end faves are from Chanel, Armani, and Jane Iredale. I’m looking to expand into Tom Ford and Japanese brands! I love multi-functional brushes because they’re best for travels and they’re time savers! I am picking my best two! (1) MAC 239 Brush Eye Shader Brush: for pack, shade, and blend eyeshadows. (2) Sigma Beauty 3DHD Kabuki Brush: for cream, liquid and powder foundation application. Also best brush for under eye concealers and for hard-to-reach places like the side of the nose and mouth. Very modern and innovative! For eye makeup, my recommendations include MAC 239 Eye Shader Brush (lid color), Chanel Eyeshadow Blender #19 (outer corner), MAC217 Blending Brush (crease and blending), Smashbox Crease Brush #10 (all-over blending), MAC 219 Pencil Brush (smudging), and MAC 211 Pointed Liner Brush (lining). See more. For face makeup, my recommendations include Hourglass No 2 Blush/Foundation Brush (foundation), Tom Ford Bronzer Brush (setting), Charlotte Tilbury Powder & Sculpt Brush (highlighting), NARS Ita Kabuki Brush (contouring), Tom Ford Cheek Brush and MAC 168 Large Angled Contour Brush (cheek color), and Real Techniques Setting Brush (concealing). See more.